But sometimes the moon really appears blue, like on May 20-21 in Hungary when fine dust from the Sahara desert blew over the country.Â Ãgnes Kiricsi,Â whose Hungarian/English blog isÂ Atmospheric OpticsÂ (not to be confused with the UK’s Atmospheric Optics website), captured the scene over Budapest.Â Her friend, Noli, captured an equally rare event with the same cause, a solar Bishop’s ringÂ as well as an iridescent cloud (which has nothing to do with Saharan sands, but is very pretty). Cuz’in Peter, who currently works at Yahoo! but is more a zseni Houyhnhnm, pointed me to Websites as Graphs, resulting in the pictures of this blog above.Â As time elapses, the picture develops more detail.Â There is even a Flickr site (tagged websitesasgraphs) to post your results.Â The technology and source used is posted on the site.Â Below is a comparison of Yahoo!’s and Google’s homepages (not fair, really, since Yahoo! is a portal and Google a search engine).Â My little blog is more complex than either (but if you want to see complexity let it work on CNN for a while). At first I thought this was a graph of network links.Â Wrong!Â It maps html syntax.Â Below isÂ the key. Â I don’t know if Yahoo! is using this technology, but they do have some cool stuffÂ® like the recent feature PipesÂ (a user’s guide).Â With it you can easily create mashups, like a combined Yahoo! & Google search, and much much more. P.S.Â A post about about Aharef’s website was made exactly 1 year agoÂ on Pharyngula. P.P.S.Â Note: the applet shows the structure of a web page, not a web site – comments on Edward Tufte’s board. P.P.P.S.Â Some more webpagegraphs:Â my employer’s homepage, my homepage, this article’s page. Web 2.0 is all about community.Â WetPaint introduced a service which makes creating Wikis a snap.Â It’s free (they provide the google ads).Â So I created a Wiki called Combinational Mathematics for the combinatorists and recreational math ethusiasts among you (the URL: http://cmath.wetpaint.com/ is simpler than the title).Â For starters there is a book list (7, including 2 online pdf books , ); a links list (9); and a list of other math Wikis (8). I also used a web widget from OUseful Info‘s blog to create a “carousel” of similar books.Â It’s really simple.Â Just enter the URL: http://blogs.open.ac.uk/Maths/ajh59/similarCarousel.php?isbn=ISBN&size=3 , substituting the ISBN code, which can be found here or here.Â Â The size is the width of the carousel. In short, it is already a fun site!Â Check it out.Â And by all means don’t contribute . 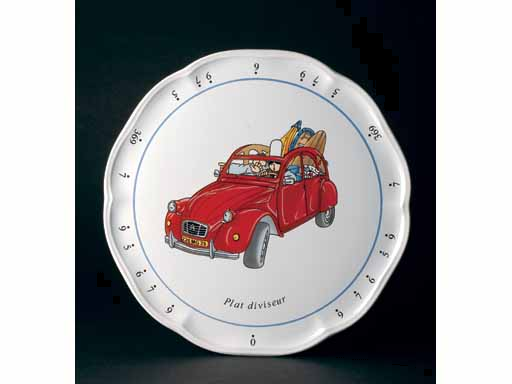 . . NOT!Â You can buy the beautiful French plates here.Â Go figure how it helps you slice a pie. Been to any good science museum(blog)s lately? You are currently browsing the johnkemeny.com weblog archives for May, 2007.